Good coffee, but NOT a dark roast. At least, not in my opinion. By far our favorite roast so far!! delicious and a perfect match for our coffee taste. We really enjoyed the rich dark flavor of this coffee. We brewed it in a French press AND in a pinch did a drip coffee maker in the mountains and both brew uses it was delicious. Hated this. Didn't match the description at all. Had a very acidic finish. I had to throw most of it out, it was gross. It was a bit too acidic and it felt more like a medium roast. I love the flavor! Perfect! It is good one, nice and dark. It can sometimes go a bit bitter, flavors is not nuanced like I would have hoped from the description. Light and delicate taste. Slight notes of caramelized sugar are nice, it's a gentle sweet that's not too much. The s'mores profile is accurate, although quite subtle. Really solid blend. Did get a little boring day after day, though. Verve NEVER disappoints! One of our favorite roasters. Sadly... We tend to drink way more coffee than​ needed when we get a bag of Verve because we love it so much and it's gone pretty quickly! Don't really care for this one. Solid dark roast blend. Great if you like consist cups, but may get a bit boring if made an everyday cup. Chemex surprisingly was the best method I used for this blend. American press was solid as well, with more body to the cup. Hello! We didn’t love the chocolate-y undertones in this shipment. We were very pleased with the second shipment - that was our favorite! We love this service, though. This blend reminded me of Foldgers...not a fan. Somewhat bitter after taste. Very good coffee but just not quite was I was looking for. I wish it were a bit more roasty and full. For some reason I kept thinking this is not complex enough... I strong note and one to follow it up. I loved this one. Rich without being bitter. Excellent! Great coffee! Takes cream and sugar very well. loved it! perfect rich robust flavor. I loved this rich coffee! I really enjoy nutty flavors (pecan, hazelnut) in my coffee without the bitterness, so this was a treat with the caramel! Perfect! Dark but not overbearing, really nice complexity. Really like this one. Smooth shot, nice roasted flavor, a natural sweetness to it with some hints of chocolate. Has a sourness that is off putting at times. Still pretty good but not my favorite. This coffee is amazing! It's bold and has rich flavors, it smells great! And it is not too acidic. More bitter than I like. And too burnt tasting. This might be my favorite coffee yet. Like the s'mores notes in it. Doesn't reach the bitter notes of a french roast, but lots of rich flavors in there. Also doesn't have the sour notes that many of the medium roast beans have. One of the best smelling beans I have ever smelled pre-grind. Drinks like a medium roast to me, but then again I must be jaded by Starbucks... Only brewed once so far, 1:15 on the Chemex. I liked it a lot. Will try 1:14 to add some more body to it. Definitely getting roasty baking spices and graham cracker. Again, I like this one, but which it had a bit more body, chocolate and smoothness. Acidity on point with what I like. I was so excited initially to try this, coffee because the aroma of the beans was exactly what I wanted. Unfortunately, after brewing, the coffee lacks the depth of flavor I want and seems too focused on sweet tones like chocolates, marshmallows, and caramel. Probably one of the top coffees I’ve tasted. This actually does taste a little like a s'more. This one goes down really fast as opposed to the more bitter ones. This is definitely sweeter than most of the shipments I received. I like the variety of some sweeter ones along with the bitter or earthy beans I've also enjoyed. Decent cup of coffee, Nice chocolate tone. Not as full bodied as I would have preferred. Good compromise between a medium and dark roast. Amazing coffee. A top 5 coffee for us for sure. Great taste, good bold roast. Love the flavor. 3.75 stars. very sensitive to grind size. This was terrible. It is not dark at all, the beans didn't grind as much as they flaked. It was nearly undrinkable. What a treat...I sometimes have limits to how dark I like my coffee, but this one is phenomenal no matter if I make it light or heavy. This one did not seem as flavorful as our earlier 2. I would never call it a bad coffee, but in comparison, the DCR and Kickapoo had a stronger and more complex taste. This had a very sour (like citric acid from tomatoes sour) taste. Also detected metallic notes. While it's purported to be full bodied, I didn't find it anything other than moderate. I found no smoke, no chocolate. Behind the sour metallic taste was very little in the way of coffee taste. This is an awesome chocolaty dark roast. It has given me no guff on my acid re-flux front. i highly recommend this to anyone who has any time of stomach problems from coffee that is unwilling to let it go. Not a fan of this coffee at all. It really confuses me why coffees like this are even referred to as a "dark" roast. There is nothing dark about this in terms of flavor or appearance. It looks, smells, and tastes absolutely nothing like a dark roast. It has an extremely sour/acidic taste that hits you almost immediately with each sip and just ruins it for me. Disappointing - great aroma but always a bittoo bitter and acidic. Very much enjoyed this one. We liked this blend. It was creamy and could easily be sweetened. Best coffee so far. Full-bodied and a pleasant aftertaste. very smoky, flat - one flavor. Did not have depth of other dark roasts. It may be in my head, but when the beans don't show any oils and look bone-dry, I tend to find the flavor lacking. I liked it. However, a bit bland. It did have a bold taste, but nothing much beyond that. While I'm no expert, there seemed to be no other notes. As with the Taylor, I'm not thinking that I'd want more than the 12 ounces. There is no wow factor here. Both Pops and I were disappointed...the actual flavor did not live up to its description. We felt this coffee was rather non descript. I loved this one! Rich and full bodied espresso with a very balanced acidity (no sourness) and complex taste. Rich. My favorite so far. This was a nice smooth coffee, the second delivery in my subscription and I liked this better than the Day Tripper blend. Not sour with a nice roasted flavor, no fruity undertones which I liked, subtle nutty flavor. Listed as a dark roast but I feel it is closer to a medium, although the caffeine kick was a little weak. Overall a very good coffee. Meh. It doesn't seem like the coffee is as dark roasted as it could be, but at the same time the coffee tastes almost burned and very acidic. I really liked the chocolate notes, but my ideal blend is a little less acidic. Not as good as the previous coffee. The smell of the coffee beans was amazing, but flavor of the coffee is too mild. Very nice coffee. I do taste the full body and some smoke and chocolate, but those flavors aren't as pronounced as I found them in the Good Folks Deep Space Blend. This coffee is listed as a dark roast, but it seems medium/dark to me. Doesn't achieve a 5 star for me, but a nice coffee nonetheless. Still reserving that 5 star review for something that hits it perfectly! I just didn't care for this one as much as the others. I am not sure why. Nice coffee. Chocolate notes and quite tasty. Listed as "dark" and not sure if that is fully accurate. Maybe between a medium and dark. If you are a medium roast person and ready for a small step toward a rich and a bit darker roast this would be perfect. For my palette, I could go a little darker. As good as the previous beans. Strong flavor but not overwhelming. Has me drinking it black more often than not to make sure I get all the different flavors. A balanced dark roast which tastes on the lighter side of the dark roast spectrum with notes of bittersweet chocolate, nut, and finishing notes of lemon. Really did like this one! Would love to find some more that are similar! I thought this coffee had a richer flavor. The first sip was delicious. Smooth dark chocolate came to mind. Roasted nut aftertaste. The flavor surprised me as the beans lighter in color than what I usually brew. Pretty good. No fruity taste. Full-bodied. I did not like this at all. Tasted sour to me. Good choice. I like the rich, bold flavor that comes through on the coffee. Notes of sweet baking spices, pink peppecorn, and toast. Nice addition to the inventory. The flavor of this coffee is absolutely amazing and I did not find it too rich after the 2nd cup. In fact, I am afraid that once I start drinking, I won't be able to stop. I had to cut myself off at 9:00 last night so that I was sure I would be able to fall asleep later. I really liked how strong this coffee was. A nice punch of flavor! Unfortunately, the flavor profile seemed to be lacking any really distinct notes to it. Lately I've been loving fruity notes, and this fell a little flat there. Tastes are so individual but, for me at least, I could not drink this one without cutting it with something else. Has a bitter taste. Sorry, first one I have not liked at all. Pretty good but not as rich as I would like. This is the best coffee I've had! Just the right amount of dark. The darkness is balanced perfectly with the chocolateyness (if that is a word). I really wanted to like this coffee. I've enjoyed most dark roasts I've tasted, but this one just didn't do it for me. It was a little too dry, and a bit too fruity and bright for me, rather than a rich, sweet flavor one would expect with a 'dark chocolate' note listed on the front of the bag. Honestly, this coffee didn't taste very extraordinary. The aftertaste was dry and nutty but not in a way that left me satisfied or eager to take another sip. I'm sure many fans of dark roasts would enjoy this but I, unfortunately, did not, as it lacked the chocolate notes I tend to expect of a dark roast, and had too much of a burnt nutty flavor that overpowered and left me wishing for a different coffee. Let me just say when I go to bed I think about waking up to this marvelous, REAL COFFEE roast. If you want notes of fruit, vanilla, coconut etc. Ya know, wimpy stuff, this ain't for you. This is COFFEE as COFFEE is meant to be. This baby could be served in 1860s Vienna or 1930s Milan. Capiche? Very good blend from a roaster right down the street from us! Smooth, cherry, hints of vanilla. 4.5 stars would be the right and exact score. A darker roast with a citrusy brightness. One of my favorite coffees I've had. I'm quite liking this as a morning cup. Clean and smooth. This is a nice, full-bodied coffee. I wasn't exactly wow'ed by this coffee, but not at all disappointed; it's a solid dark roast, but maybe a little more acidic than I'm used to. I like getting out of my comfort zone, so I'm enjoying it. I tried this using a pour-over and a french press, and I prefer this as a pour-over. I prefer and requested a darker coffee roast. This coffee tastes like sour straw. By far our favorite so far!! Although I'm not a fan of dark chocolate this actually wasn't too bad! Really enjoyed this coffee. Nice and rich, but not too bold in the hot weather. I'm really loving this coffee. Very smooth and silky. Absolutely love this coffee. It brews perfectly in a french press. After 1 minute stir and let steep for another 3. This is a solid cup, no doubt about it. It has some nice dark chocolate and nutty flavors but there is something that I cannot put my finger on. Something almost sour in the taste. All-in-all, it is a nice cup. This was a better dark roast. The problem for me is that it's too sweet. I like coffee that is bold, more on the bitter side and dark. I'm new to this online coffee subscription service and I guess I'm having trouble find coffee that I would buy again. Not sure what to do. This is the best cup of coffee I've ever made in my own home. Love the chocolate notes in this...has a good full body but does have a little bit of a bitter finish, but not bad. We both enjoyed this & rated it a 4. My wife picked up the smoke & chocolate notes, but not the almond. Strong almond taste. Have to add a lot of beans to make the brew strong. Prefer something bolder. Not enough depth of favors for me either. Great taste and great smell after brew. I enjoyed this roast and would buy again. This is what you want in a dark roast! Big, bold, and surprisingly smooth. Has an earthy taste that I typically wouldn't like but is quite good. Excellent flavor. Light smoke. Deep dark chocolate. Fantastic Dark Roast. Good flavor and scent. interesting smokiness but still bright notes. I love this coffee! It has just the right amount of bitterness which is well complemented by its deep, yet smoothly mellow, flavor. The cocoa notes are pleasant. Very good, but not quite as robust as some of our favorites. This has a little bit of a "flat" taste to it. Very Full Bodied, Smokey, chocolate taste! I Like it a lot! This blend is a bit lighter than a typical "dark" roast. The beans were not oily and had a chocolate, nutty smell. When brewed, the flavor was almost fruity with bright notes. I found the taste and balance to be too acidic for me. Nutty, Bitter. Great but one small pack is enough. Perfect balance of smoke, chocolate, and mostly nutty. Love this blend! Easily the best we have received so far - this is be the standard for the next samples to be judged against. Good deep favor with a lasting taste in the palette. Very good full bodied coffee. Competent but not interesting. A little sweet but I like the depth of flavor. Our first 5 star rating!! 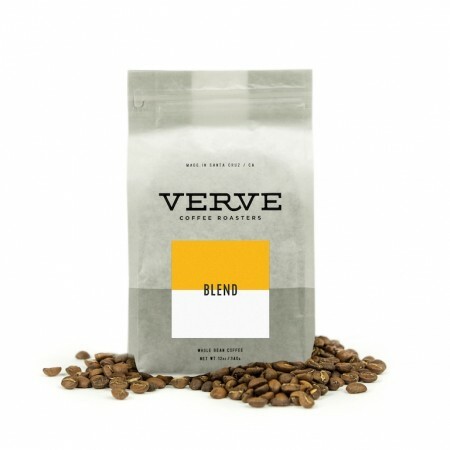 We love the deeply roasted, full bodied blend with slightly sweet caramel overtones. Perfection in a coffee cup! excellent with a hint of cream accompagnied by a fine dessert. The best go-with-dark-chocolate coffee I can remember. This is dark, rich, and delicious! I love it! Full and rich. Clean taste. Always a fan of Verve! I very much enjoyed my first cup of Verve's Buena Vista Dark roast this morning. The beans smelled amazing and the aroma filled my kitchen when I course ground them. I brewed using a hario v60 and slow pour over. The coffee is actually lighter than I thought it would be, but not weak. I get a distinct flavor of almonds, which I like. This was my first bag from mistobox, and I'm a fan! Really tasty coffee starting off my morning right.